Emphysema is one of a group of diseases called COPD (chronic obstructive pulmonary disease). It is a serious health problem, why? Because it can lead to some serious complications that could be life threatening. In essence, it can seriously hurt and destroy your lungs. It is more common in smokers, though it can also affect non smokers! Emphysema is one of the most common types of COPD. If you have this respiratory condition, you can exhale as if something were obstructing or blocking the flow of air. That’s why it is called obstructive. Smoking is often to blame. It is the main cause of emphysema in the vast majority of people. Study suggests that smokers are 6 times more likely to develop the disease – if compared to non smokers. Unfortunately, the exactly way of how smoking can trigger and cause the disease is not fully known yet. Interestingly, most smokers don’t develop emphysema. Experts still don’t understand why some smokers develop it and others don’t. But in general, all heavy smokers do experience negative effect of chewing tobacco. It’s still thought that avoiding smoking (including for secondhand smoke) is the best way to prevent emphysema! Alpha-1 antitrypsin (AAT) deficiency, a genetic condition. AAT is a kind of protein, natural protein that circulates in the blood. It is important to keep white blood cells from destroying unexpected targets, such as normal and healthy tissues. However if compared to smoking, this deficiency is still a minor cause of emphysema. Long-term exposure to other airborne irritants such as air pollution and manufacturing fumes. There are usually no early signs and symptoms until the disease becomes advanced. Typically it progresses slowly, and you may have it for many years without noticing any symptom. Shortness of breath is usually the most common symptom of the disease. At first, your breathlessness is mild and doesn’t significantly interfere with your daily activities. But it can get worse over time as the disease progresses to become advanced. In severe case, shortness breath can occur anytime, even while you’re at rest for example. Other signs and symptoms may include: wheezing, coughing, and chest tightness /pain. Emphysema may also cause poor appetite, weight loss, and difficulty sleeping. So, why is emphysema a serious health problem? The lungs have lots of smallest airways, some of them are bronchioles. 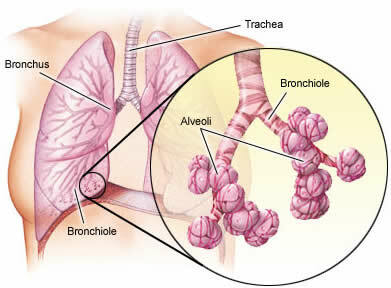 Air that you breathe will eventually pass through tiny ducts from the bronchioles into the alveoli (air sacs). The alveoli are surrounded by special membrane called alveolar-capillary membrane that plays a role to prevent liquid from entering the air sacs. Emphysema can destroy your alveoli, making it progressively difficult and harder to breath. The lung changes usually evolve slowly over years. How does emphysema impair with your lung function? As the soft, fragile tissues between alveoli are damaged – air pockets develop in the lung. Then air is easier to get trapped in the spaces of destroyed lung tissue, causing airflow limitation. This will make you take far longer to empty your lungs. 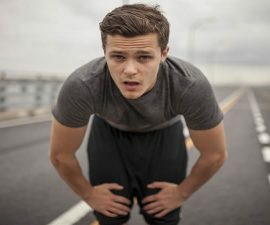 Over time the lung enlarges slowly and you’re more difficult to take a breath (now your breathing requires more effort). Currently, emphysema is irreversible – there is still no cure. But some effective treatments are available to control and manage it so the complications of the disease can be prevented. Emphysema is considered as a serious health problem since it can lead to life-threatening complications such as pneumothorax, heart problems, and giant bullae. In severe case of emphysema, air can leak into the space between the chest wall and lung. 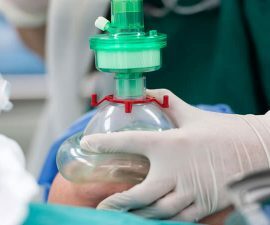 As a result, there will be more pressure that pushes on the outside of the lung, causing a collapsed lung (pneumothorax). 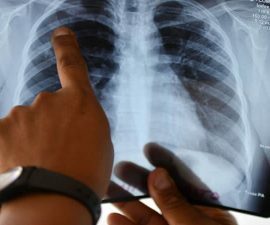 Typically, there is only a portion of the lung that collapses. However pneumothorax is a serious complication – even it can be life threatening in patients with advanced emphysema. When pneumothorax has occurred, the lung function is already so compromised. Fortunately, it is rare! Shortness of breath and chest pain is the most common symptoms of pneumothorax. You should get immediate emergency care if your shortness of breath and chest pain get worse! The goal of the treatment is dependent on the severity of the condition and the overall health of patient. But in general, the goal is to help relieve the pressure on the lung, making it re-expand as normal as possible. Surgical treatment is not always necessary. For instance, your doctor may simply monitor the condition with imaging tests if you only have a small portion of collapsed lung until the excess air is entirely absorbed. Meanwhile, you may only need to take supplemental oxygen to help speed the absorption process. And it’s also important to prevent recurrences afterward. Pneumothorax can return in some cases. People with pneumothorax are still at high risk of developing another pneumothorax within 1-2 years of the first.